Josanne Cassar | Banif Bank is 5 years old! You are here: Home » Business » Banif Bank is 5 years old! Banif Bank is 5 years old! Banif Bank has this week celebrated its 5th birthday. 5 years ago on January 21, 2008, Banif opened its doors to customers, and officially started operations from its first branch in St Julians. Since then, the Bank has expanded its footprint to nine retail branches and a corporate and business banking unit, and rapidly grew its customer base. The Bank is driven by a strong team of over 150 employees and offers customers and businesses a wide range of innovative products and services. 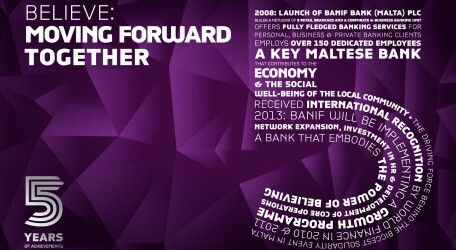 In its five years of operations, Banif has received international recognition by World Finance in 2010 and 2011, and become the driving force behind the biggest solidarity event inMalta. To kick-start a series of events that will celebrate the Bank’s 5th anniversary and mark 5 successful years, the Bank surprised staff with a tasty breakfast on its birthday, as a gesture of appreciation for the team’s hard work that drives the Bank’s operations. Freshly baked croissants, bagels and berry smoothies found their way to desks early in the morning, so that employees could start an otherwise bleak and rainy Monday with a well-deserved treat. And to celebrate its birthday with customers, Banif Bank offered its clients a limited offer Super [email protected] Term Deposit that boasted a lucrative term and rate of interest. Banif reserves its best offers for its customers, and the product was only available to clients, who applied for the term deposit account through the Bank’s [email protected] internet banking. Banif Bank will, this year, continue to celebrate its 5years of success with employees, customers and other stakeholders.